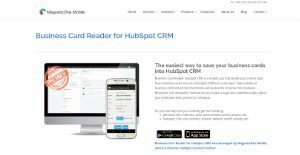 What is Business Card Reader for HubSpot CRM? Business Card Reader for Hubspot CRM is a mobile business card reader application that can be integrated into your HubSpot CRM account, allowing your Android mobile device to capture information from business cards via the rear-facing camera of your smartphone or tablet. Developed by MagneticOne Mobile, the business card reader app is capable of processing five business cards per minute. Business Card Reader for Hubspot CRM simplifies and accelerates the capturing, processing, and storing of contact details from business cards and into your HubSpot CRM. This application effectively eliminates the need to collect business cards from your contacts and manually gather all the necessary contact information into your system. Business Card Reader for Hubspot CRM makes it easy for you and your team to gather contact details from your clients, potential customers, partners, and more without having to gather their business cards, collect their contact information manually, and store those cards for future reference. In fact, with just your Android mobile device’s rear-facing camera, the app lets you scan business cards and get all the information you need and store it directly to your HubSpot CRM account. Once you get all the information you need, you can preview all the details and make the necessary modifications prior to saving all the contact details of your clients, leads, and potential business partners/customers. Business Card Reader for Hubspot CRM is compatible with the Android operating system, which means it is easy for users with Android smartphones to get all business card details in a snap. Business Card Reader for Hubspot CRM is built using the latest information capture technology, resulting in the precise conversion of all essential data found in the business card. On top of that, the application boasts of multi-language support, capable of recognizing 25 languages. This allows you to capture and convert data from multilingual business cards with ease and accuracy. Business Card Reader for Hubspot CRM utilizes top class security protocols and measures to safeguard the details of your contacts. Also, it is built in accordance to prevailing laws as well as the right to privacy. What Problems Will Business Card Reader for HubSpot CRM Solve? In conferences, business meetings, conferences or trade fairs when you need to scan the info quickly and to transfer it directly to CRM. When you have a lot of business cards and you don’t want to enter information manually. If you are considering Business Card Reader for HubSpot CRM it could also be beneficial to check out other subcategories of Best Business Intelligence Software listed in our base of B2B software reviews. Since each company has particular business needs, it is prudent for them to abstain from seeking a one-size-fits-all perfect software system. Needless to say, it would be useless to try to find such a system even among market-leading software applications. The intelligent thing to do would be to catalog the various essential aspects that require consideration such as key features, finances, skill levels of employees, company size etc. Then, you should do your homework thoroughly. Read some Business Card Reader for HubSpot CRM reviews and look into each of the other apps in your shortlist in detail. Such comprehensive research can make sure you reject ill-fitting systems and select the solution that presents all the features you require for business success. How Much Does Business Card Reader for HubSpot CRM Cost? We realize that when you make a decision to buy CRM Software it’s important not only to see how experts evaluate it in their reviews, but also to find out if the real people and companies that buy it are actually satisfied with the product. That’s why we’ve created our behavior-based Customer Satisfaction Algorithm™ that gathers customer reviews, comments and Business Card Reader for HubSpot CRM reviews across a wide range of social media sites. The data is then presented in an easy to digest form showing how many people had positive and negative experience with Business Card Reader for HubSpot CRM. With that information at hand you should be equipped to make an informed buying decision that you won’t regret. What are Business Card Reader for HubSpot CRM pricing details? What integrations are available for Business Card Reader for HubSpot CRM? At the moment, Business Card Reader for Hubspot CRM by MagneticOne Mobile integrates not only with HubSpot CRM but also with 32 other CRM systems including Pipedrive, Salesforce, Prosperworks, Zoho, Infusionsoft and other.